Most of us know that staying active can help us live longer, healthier lives. But once you get older and your body doesn’t hop out of bed pain-free, how do you stay active? 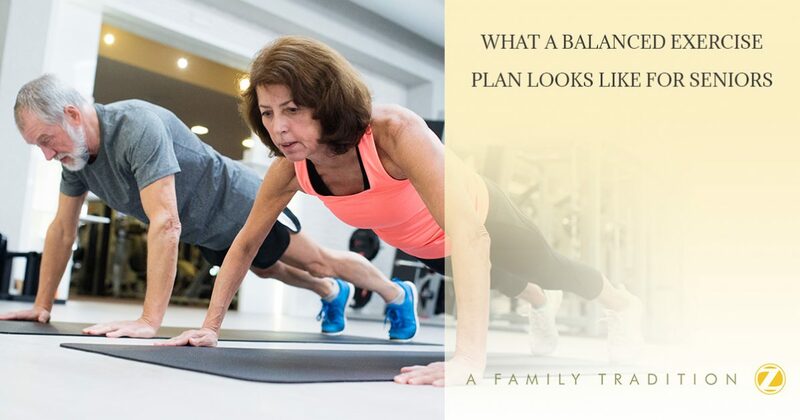 In our last blog, we discussed several misconceptions that keep people from rewarding, active lifestyles, but once you’re ready to be active, what should it look like? Well, we’re going to take this blog to answer those questions and provide you a snapshot of the four important aspects that should show up in every routine. Cardio uses your large muscle groups in repetitive motions over a certain period of time. This type of exercise includes hiking, walking, dancing, swimming, cycling, stair climbing, and stair walking. It will get your heart beating faster and should make you feel a little short of breath. Why is it good for me? Cardio can eliminate shortness of breath and fatigue, which will keep you more independent. You won’t have to feel worn down by activities like errands, walking, and house cleaning. This is usually a big one for seniors, who want to avoid falls whenever possible. Balance keeps you safe when you’re standing and moving around. It can be developed by Tai Chi, posture exercises, and yoga, which can help both your body and mind while being gentle forms of exercise. Why is it good for me? Improved walking, posture, and balance make it easier to get around while reducing the risk of falls. 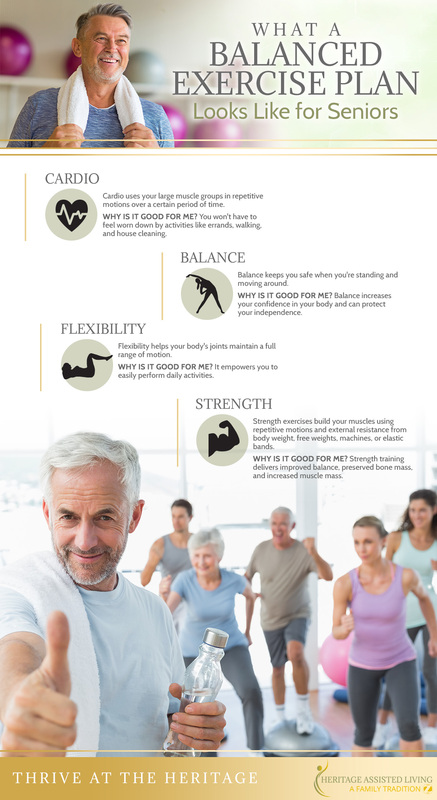 Balance also increases your confidence in your body and can protect your independence. Flexibility helps your body’s joints maintain a full range of motion. It keeps your muscles and joints supple, which protects them from injuries. You can enhance your flexibility via yoga, stationary stretches, and active stretches. Why is it good for me? It maintains your range of movement so you can perform daily activities like tying your shoelaces, looking over your shoulder while driving, playing with your grandkids, and washing your hair. Strength exercises build your muscles using repetitive motions and external resistance from body weight, free weights, machines, or elastic bands. Because strengthening exercises are designed to improve reaction times and power, they are often done quickly. Why is it good for me? Strength training delivers several benefits, including improved balance, preserved bone mass, and increased muscle mass. All of these benefits help you avoid falls. They can also help you move faster and react quickly if you lose your balance or trip. Lastly, strength exercises can play a critical role in empowering you to perform daily activities, and this keeps you independent. There is no reason that your senior years can’t be the best ones of your life. At The Heritage, we place special emphasis on making our assisted living community active, vibrant, and full of personal growth. We encourage you to visit us in New Jersey for a tour. We would love to meet you! ©2017 HERITAGE ASSISTED LIVING - Do not copy. All rights reserved.